OMAHA, Neb. (KMTV) — Vice President Mike Pence was at a family farm near the Missouri River west of Pacific Junction. He, Iowa Governor Kim Reynolds, and Senators Joni Ernst, and Chuck Grassley toured Lincoln’s Ridgeview Farms, which has been around for more than 100 years. 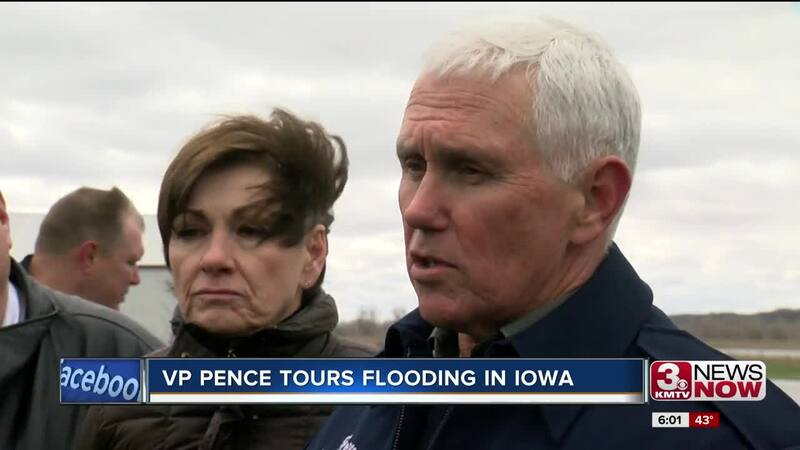 Pence urged congress to approve a disaster relief plan for Iowa and Nebraska. There's an estimated $1.6 billion in damage from the floods in Iowa. President Trump has approved the disaster assistance request for Nebraska and Iowa, but the money hasn't come yet. We streamed the VP's visit here, on Facebook, on the 3 News Now App and on your streaming devices. "It's frustrating to your senators it's frustrating to the President and me and we're just calling on Democrats in the Senate to recognize what's happening here on the ground in Iowa and Nebraska and all across the Midwest and approve disaster assistance and approve it now,” VP Pence explained. A bill for federal assistance has been stuck in Congress because Democrats want more hurricane recovery money for Puerto Rico. President trump is against more funds for Puerto Rico. Iowa Governor Kim Reynolds says there are 4 major levee breaks along the Missouri River in Iowa, and they need federal money to fix them.